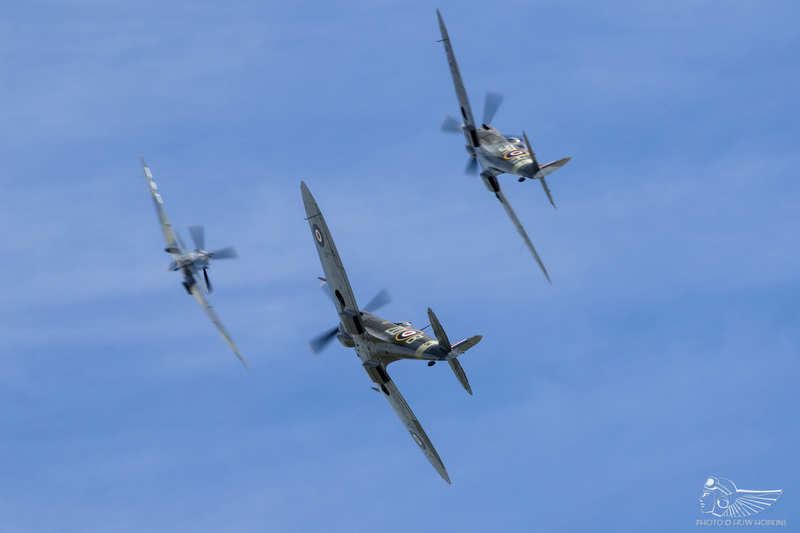 Flying Legends has outlasted the revered Fighter Meet and Great Warbirds airshows of the ’80s and ’90s, subtly evolving over the years but never losing sight of its unique appeal. 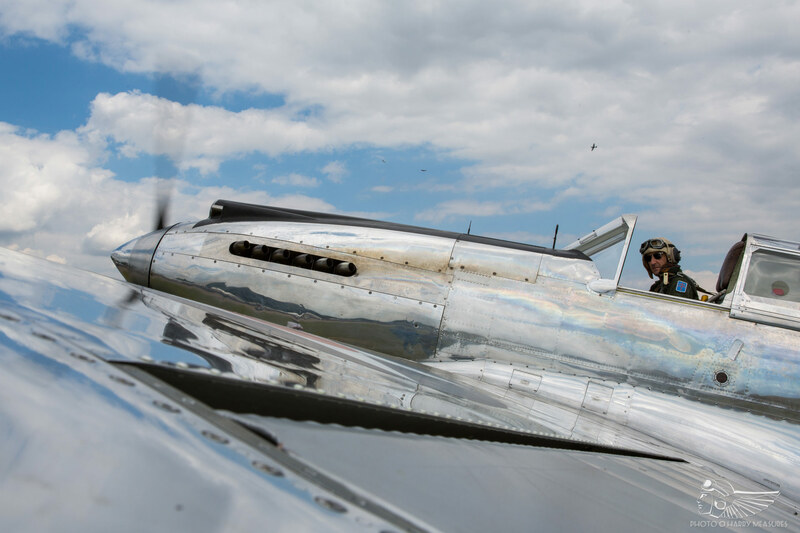 Whereas those shows diluted the vintage formula with generic civilian acts as the years wore on, ‘Legends has rigidly maintained its focus on classic aviation. Suffice to say there will never be another event quite like it. 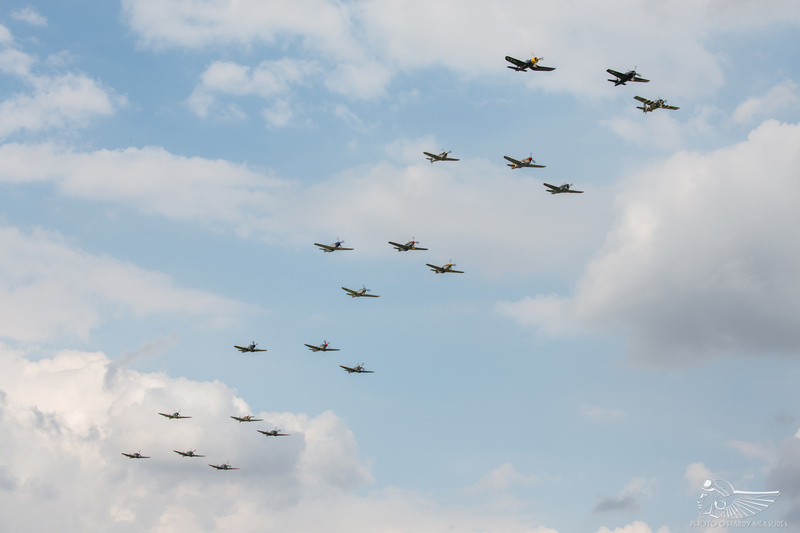 Even with a lack of European participants on the flying programme, and a number of cancellations late in the day (including the high-profile début of Bf109E ‘White 14’), the 25th iteration of Flying Legends delivered an abundance of high-quality flying, rare aeroplanes and landmark displays. Thousands travel from around the world to enjoy the airshow, and meeting friends old and new is part of what makes the weekend so special. 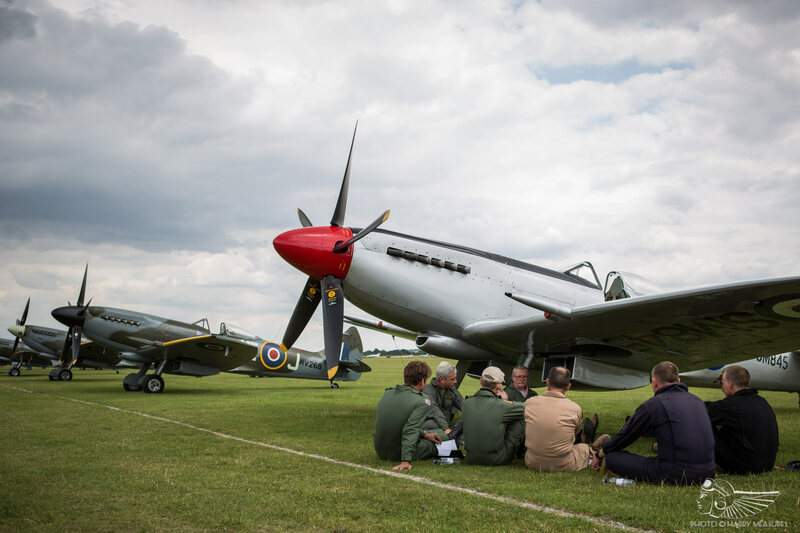 People you see just once a year are drawn back to the aerodrome each July by a shared passion for historic aviation. The long morning walk along the main traders’ drag is filled with familiar faces and warm conversations as you catch up on the last 12 months’ goings on. The atmosphere is nothing short of electric, the buzz unlike any other UK airshow. In a break from tradition, Sunday’s pre-show aerial entertainment was provided by the Red Arrows. 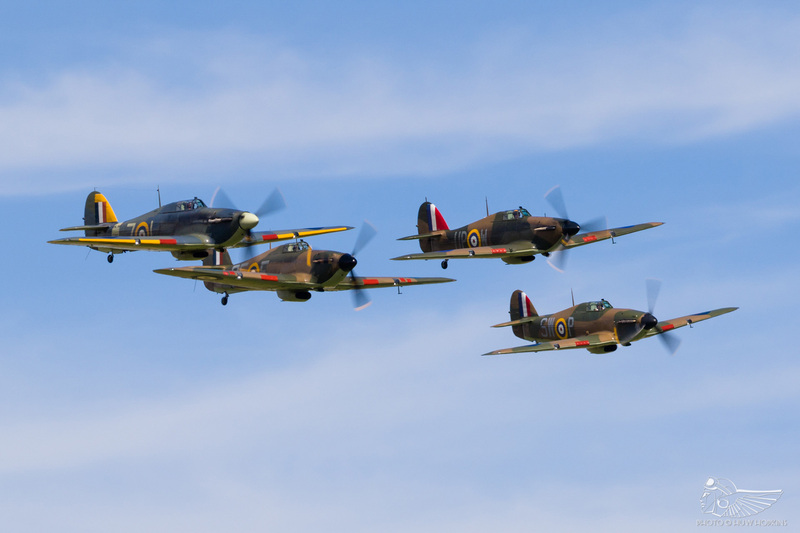 Their scheduling dredged up considerable pre-show controversy from those who felt they didn’t “belong” at Flying Legends, but I can’t say I felt too strongly either way. Ultimately, the Reds are a big draw for the crowds and if their inclusion helped to sell tickets, that can only be a good thing for Legends’ longevity. There has been much discussion regarding the skewed, considerably more distant display line adopted by the Red Arrows and one has to call into question how the RAF intend to participate at airshows in future if they have become so risk averse, despite having spent years conducting safe displays at the same venues. The Reds naturally suffered from being so distant, but I can’t say it affected my enjoyment of the day in any way – ‘Legends is about vintage aviation, first and foremost – although I appreciate that those who bought their tickets solely on the back of their appearance may feel differently and would have appreciated some forewarning, if only to position themselves at the western end of the aerodrome (and thus closer to the temporary line adopted for the Reds’ display). 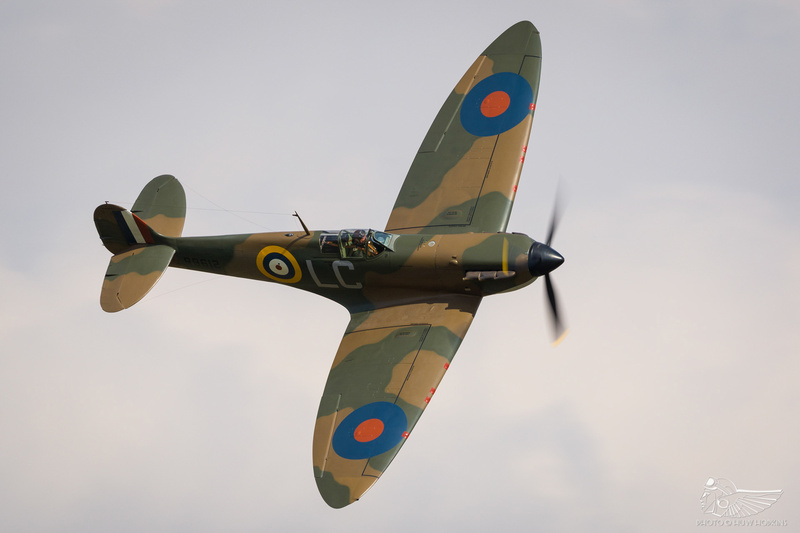 Flying Legends has always been different to other UK airshows – rather than a succession of solos, the programme is built around a series of themed multi-aircraft set-pieces with an emphasis on spectacle and unique combinations. 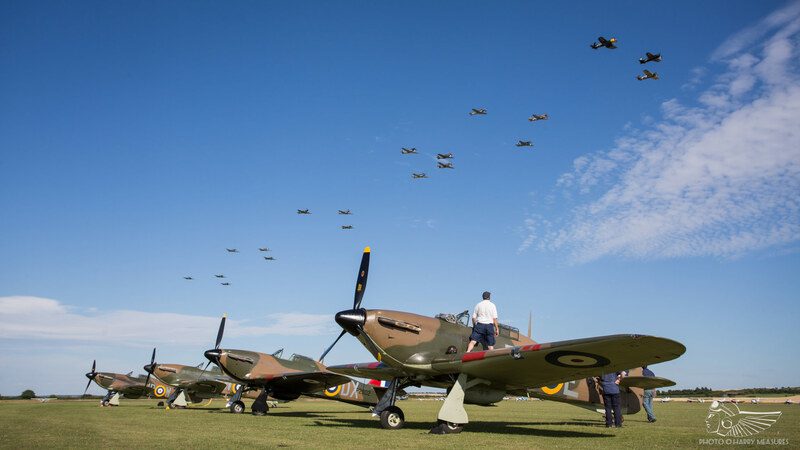 From the moment the show-opening Spitfire nine-ship (including one interloping Seafire Mk.III) fired up and taxied to hold for take-off, the sense of anticipation and occasion was as palpable as ever – that is the true spirit of Flying Legends. The ‘Spitfire overture’ epitomised the type of layered routines ‘Legends is famous for. On this occasion, Cliff Spink led the nine Spitfires in Mk.XVIII SM845 with marks V, IX, T.IX and XIV following him for a series of formation passes before the elements split, three aircraft flying low passes along the grass whilst the remaining six flew a big dumbbell tail chase to the south. International visitors have always given Flying Legends a unique edge and over the years we have seen countless aeroplanes shipped or flown to the UK to participate at the show – the likes of A-36 Apache, Grummans F3-F and G-32, Polikarpovs I-15 and I-16, P-26 Peashooter and SAAB B-17 would never have been seen in the UK without the efforts of The Fighter Collection (TFC) and their respective owners and operators. This year saw two Mustangs visiting from the USA, courtesy of the Comanche Fighters stable. P-51D Mustang Frenesi was shipped across the Atlantic for reassembly in June, whilst rare P-51B Mustang Berlin Express flew nearly 5,000nm across the North Atlantic to participate. 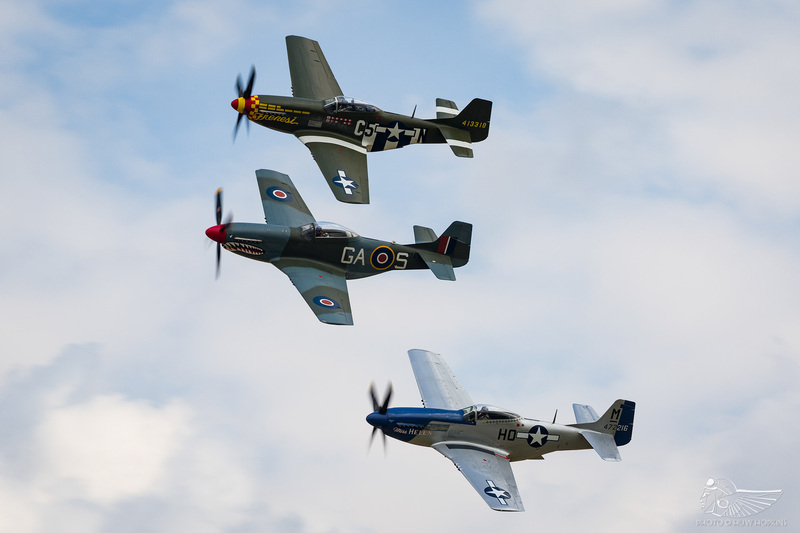 The two Mustangs were to form part of the Horsemen Flight Team’s trio alongside P-51D Mustang ‘The Shark’ (G-SHWN, operated by the Norwegian Spitfire Foundation), whilst Berlin Express was scheduled to fly a further four times over the weekend (including in the “joker” slot at the end of the show) in the hands of Nick Grey. As fate would have it, Berlin Express’ Perspex canopy disintegrated during Nick Grey’s first 400mph+ run in on Saturday afternoon. 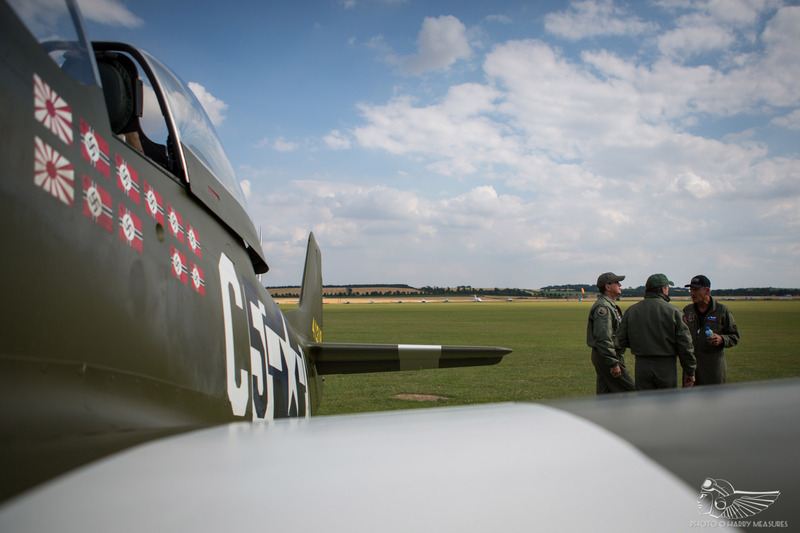 Whilst the Mustang landed safely, it was unable to participate in the rest of the weekend’s flying; a great shame, particularly considering the lengths taken to bring it to Duxford. With no fewer than six appearances scheduled over the weekend, Berlin Express would have been given star treatment – alas, it was not meant to be! 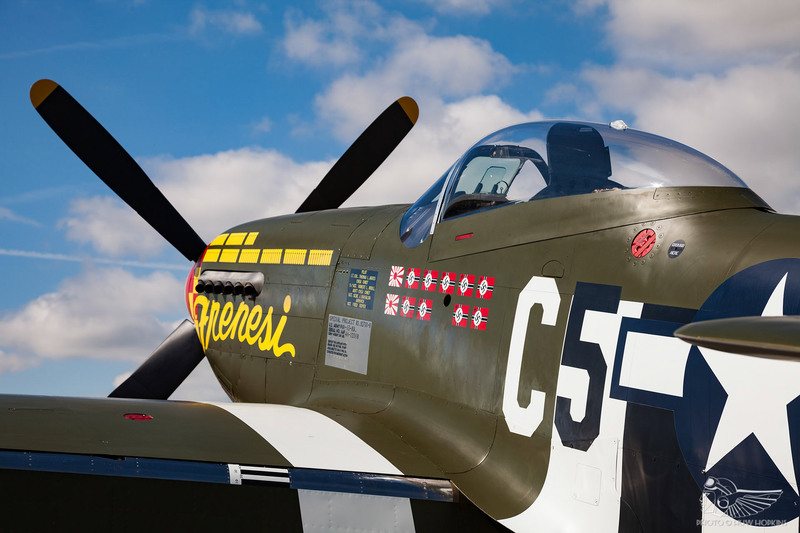 The Horsemen necessarily scrubbed their Saturday display, the team of Steve Hinton, Ed Shipley and Dan Friedkin reconvening for a three-ship practice at around 8pm on Saturday evening in P-51Ds ‘The Shark’, Frenesi and substitute Mustang Miss Helen. All was not lost, then, and Sunday saw the Horsemen fly their flawless close formation aerobatics for an appreciative audience. I have long been an admirer of the Horsemen’s brand of airshow flying. Their current routine is one of grace and elegance, the trio flying big, sweeping aerobatic figures as a formation before splitting into elements of one and two. 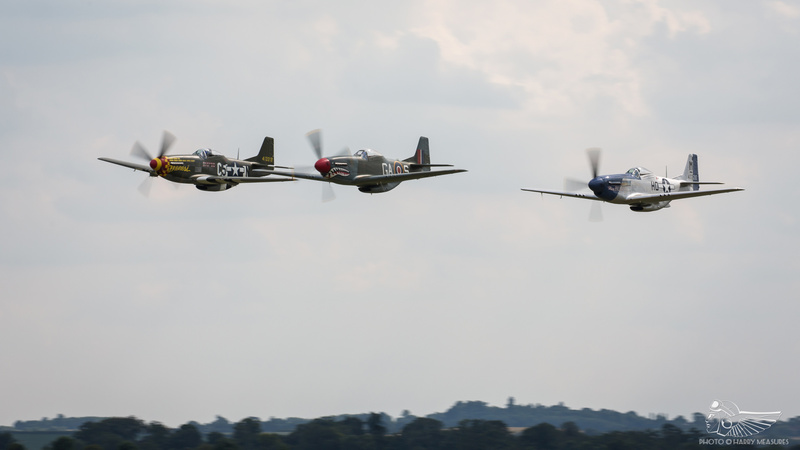 Particularly impressive are the rolling vertical manoeuvres and seeing three Mustangs flying quarter clovers and barrel rolls in perfect formation, just feet from one another, is a hell of a spectacle. Miss Helen also appeared in the traditional “Mustang stampede” (as it was dubbed at ‘Legends of old) alongside TF-51D Miss Velma. 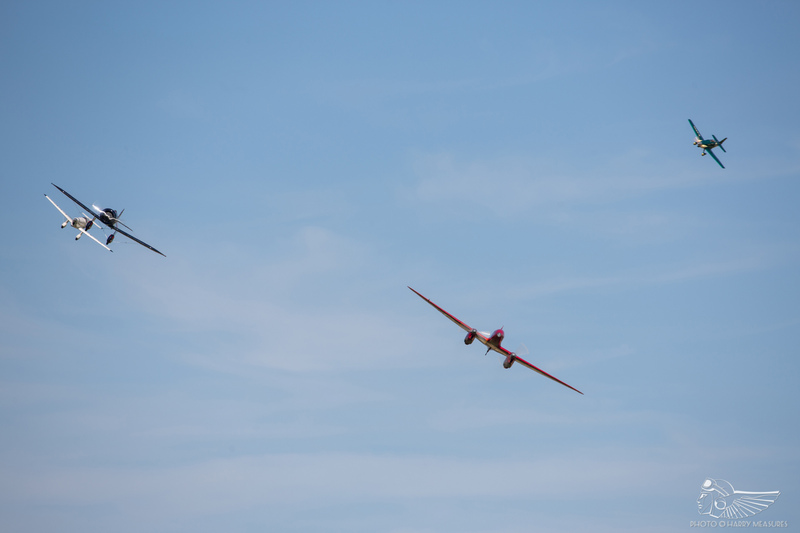 John Dodd and Mark Levy made low, fast and close passes in some of the most exciting flying of the weekend while Lars Ness put ‘The Shark’ through a vigorous solo aerobatic routine before joining with B-17 Sally B for a number of formation passes. Though Mustang numbers have dwindled as the years have worn on, it remains one of the most anticipated sequences of the show.  Though ‘Legends has evolved over the last 24 years, the high standards of flying have been maintained. 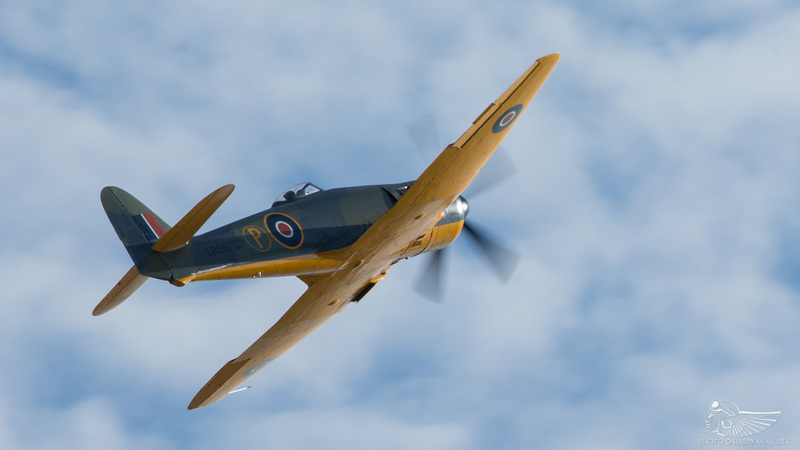 Take, for instance, 2017’s ‘ultimate big pistons’ pairing of Anglia Aircraft Restorations’ Hawker Fury ISS and TFC’s Grumman Bearcat, flown with tremendous verve by Richard Grace and Pete Kynsey respectively. Flying Legends aficionados doubtless felt a pang of nostalgia as they recalled with fondness the Fury and Bearcat duo composed by Ray Hanna and Stephen Grey in the mid-1990s. 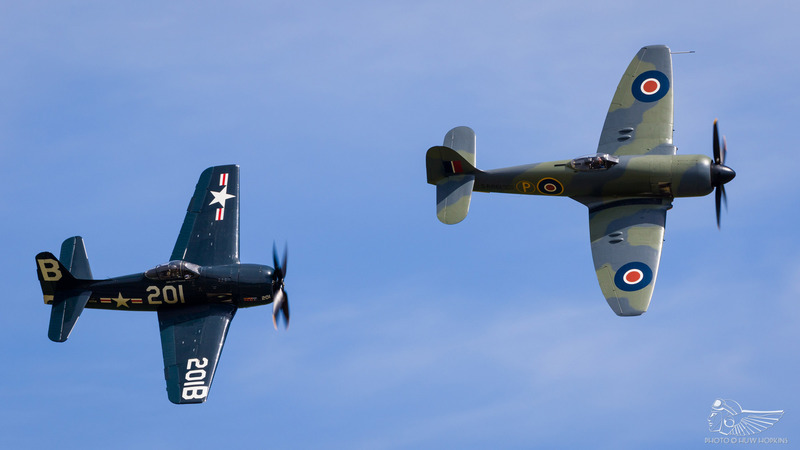 More than 20 years later, we once again enjoyed a powerhouse display of close formation aerobatics and tail chasing flown by two of the world’s finest exponents of high performance historic aircraft. 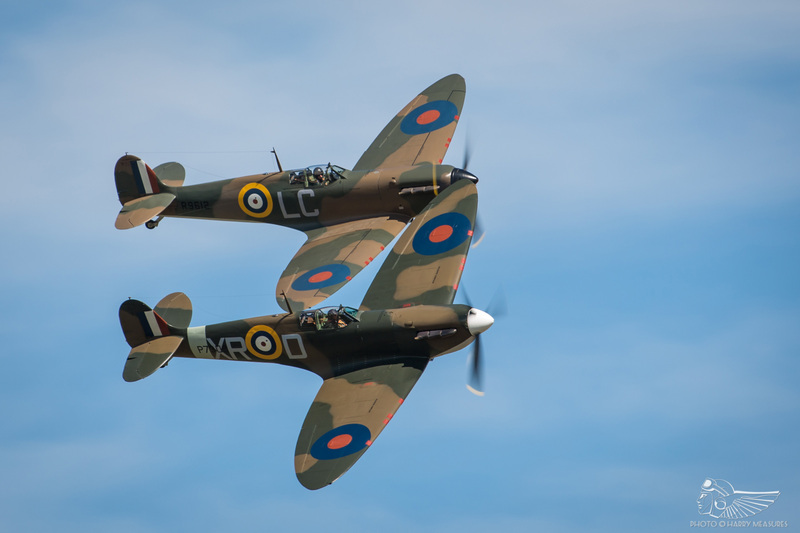 Flying Legends has a long history of delivering unique formations that reflect the richness of the British historic aviation scene, and 2017 was no exception. Looking back as far as 1998, the then annual ‘Mercury Flight’ reached its pinnacle with the Bristol Blenheim leading Gloster Gladiator and three Westland Lysanders. 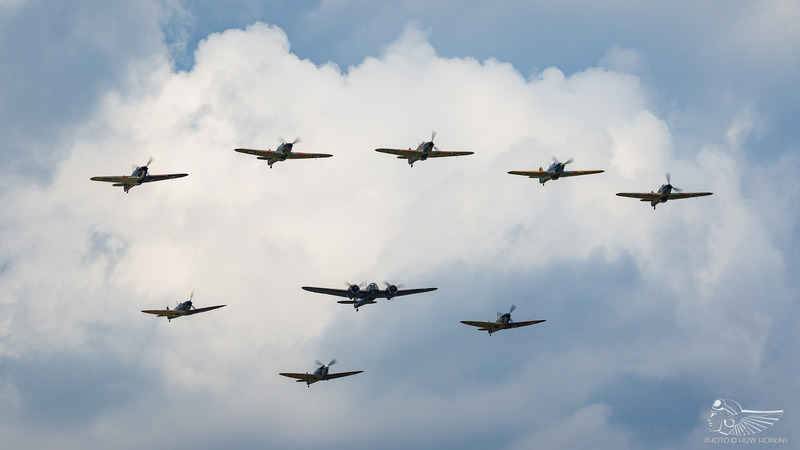 In recent years, we have been privileged to see a number of formations that just a decade or so ago would have been deemed an impossibility, including one-off quartets of Hawker biplanes and Spitfire Mk.Is. 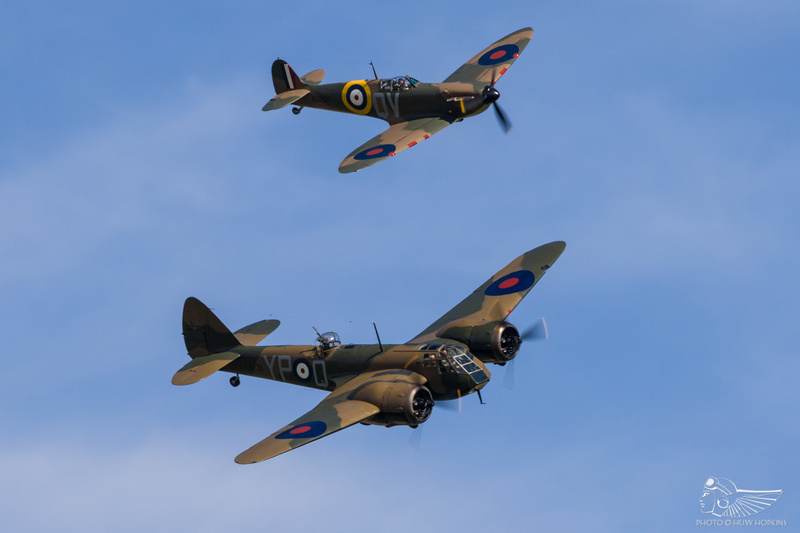 Impressive Battle of Britain formations have featured at the most recent Flying Legends, and adding to this back catalogue was a diamond nine comprised of five Hawker Hurricanes, Blenheim and three Spitfire Mk.Is. Whilst there are now nine Hurricanes flying in the UK, seeing any number of them in one place has always been a challenge. Flying Legends itself has featured trios and quartets of Hurricanes as far back as 1997 and as many as six have been mustered in one place (Goodwood 2015, albeit they did not fly together), but gathering five of the type – and flying them in a ‘vic’ formation alongside other RAF aeroplanes of the same era – really is unprecedented. Two new Hurricanes joined the ranks in 2017, with Hawker Restorations Ltd’s lengthy rebuilds of Hugh Taylor’s Mk.II P3717 and Anglia Aircraft Restorations’ Mk.I P2902 both reaching a positive conclusion earlier in the year. Indeed, the latter only arrived at Duxford on Saturday morning, having concluded its test flying schedule in the days before the event. Alongside these ‘Legends débuts were the Historic Aircraft Collection’s Mk.XII (which flew late on Friday after extended winter maintenance) and, visiting from Old Warden with their stable mate P3717, Hurricane Heritage’s Mk.I R4118 and The Shuttleworth Collection’s Sea Hurricane Mk.Ib. The quintet were unable to assemble as a formation on Saturday, but Sunday saw all the pieces fall into place and the spectacular ‘diamond nine’ formation made one pass before splitting into their individual elements. 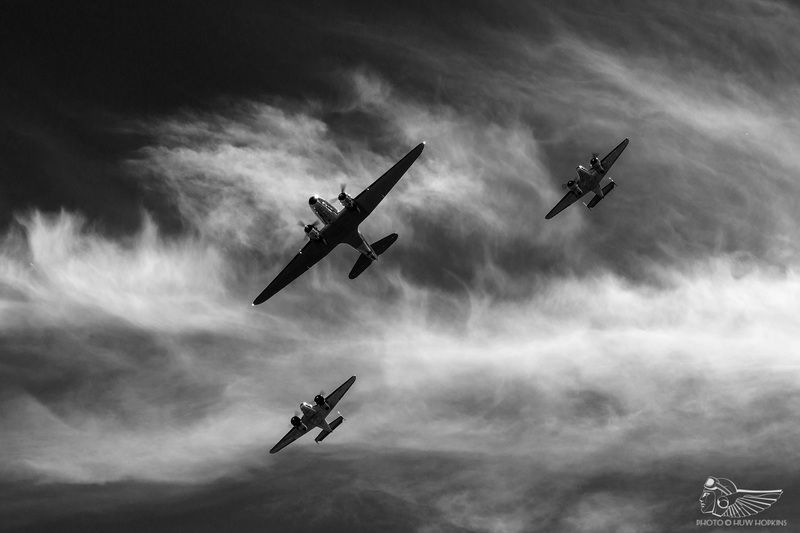 Emotional and evocative, this was one of the very best Flying Legends moments. The underdogs were then afforded their own sequence in the programme, with Frank Chapman (Saturday) and Dave Harvey (Sunday) leading four of the Hurricanes for a sedate tail chase over the grass. 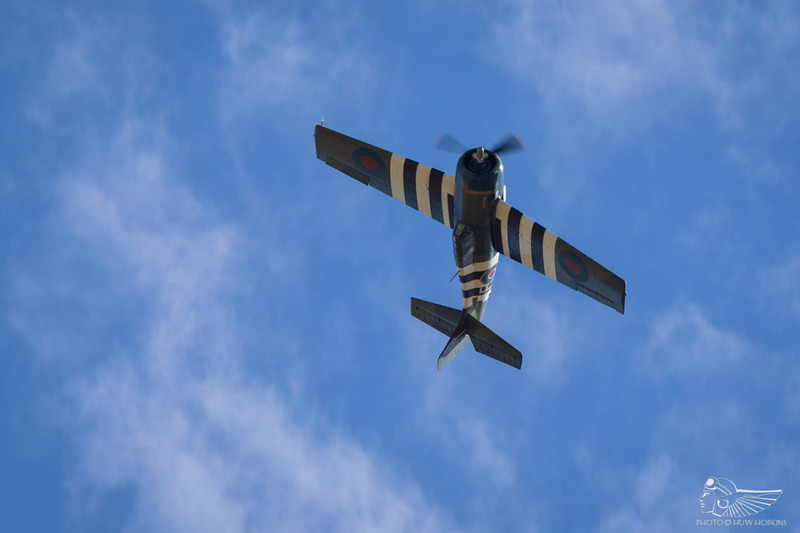 Meanwhile, Stuart Goldspink flew a solo aerobatic routine in Hurricane P2902, showing off the aircraft’s attractive black and white undersides to good effect. These really are quite remarkable times. Currently, three Hurricanes are based a few miles up the road at Old Warden. 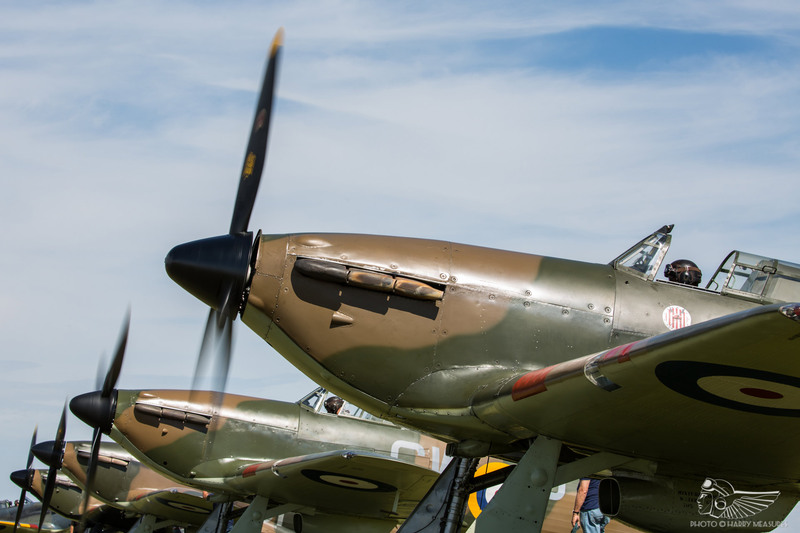 With P2902’s arrival, Duxford’s Hurricane population has doubled and the arrival of a third machine in the not too distant future will see six Hurricanes stationed within 30 miles of one another. That notion, just a few short years ago, would have seemed all but impossible. Completing the Battle of Britain section were Brian Smith and Pete Kynsey flying beautiful close formation aerobatics in Comanche’s Spitfire Mk.Is AR213 and X4650, and a well put together combination of Blenheim and Dunkirk veteran Spitfire Mk.I N3200. Such sights are unique to Flying Legends, and if the previous 24 shows have taught us anything it is that we mustn’t take any of it for granted. 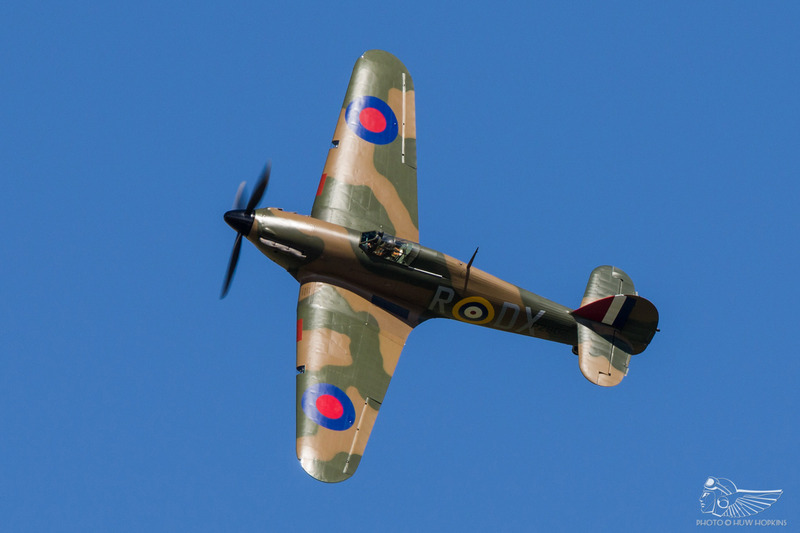 Innumerable types have been and gone over the years and some expected to become commonplace – the aforementioned Hawker biplane and Spitfire Mk.I quartets, for example – are now recalled as one-off marquee displays. Equally, long-standing residents such as TFC’s Corsair (flown by Brian Smith) and Bearcat (demonstrated in typically potent solo aerobatics by Pete Kynsey on Saturday afternoon) may be considered ‘usual suspects’ by long-time Duxford visitors, but their significance within the European airshow scene and the wider warbird community should not be overlooked. TFC’s trio of Curtiss fighters offer another case in point. P-40s C and F (flown by Patrice Marchasson and Alan Wade respectively) are the sole airworthy examples of those particular variants in Europe, whilst the Hawk 75 (displayed by Rolf Meum) remains the world’s only flying H75. The regularity with which they appear at Duxford doesn’t diminish their rarity and it’s imperative that we enjoy them while we can. In a pleasing twist, the P-40F and ARCo’s Hispano Buchón (wearing a temporary desert scheme) were flown together to re-enact the dogfight depicted on the Flying Legends 2017 poster. Whilst Saturday’s formation passes and tail chase felt very subdued, Sunday’s more spirited aerobatic tangle was particularly enjoyable. There’s mileage to be had in “re-enacting” each year’s poster, with the potential for it to become a fun annual segment. The de Havilland DH.88 Comet, Travel Air Mystery Ship, Percival Mew Gull and Cosmic Wind served a fantastic contrast of types and engine notes during their formation pass and mock air race. The inclusion of interwar civilian aeroplanes has always offered a pleasant interlude from the many fighters that dominate the flying programme and this segment was a real delight – an ode to the age of innocence, where aircraft were primarily used for pleasure. Similarly, Anna Walker’s elegant aerobatic display in the Bucker Jungmann is always one to appreciate. 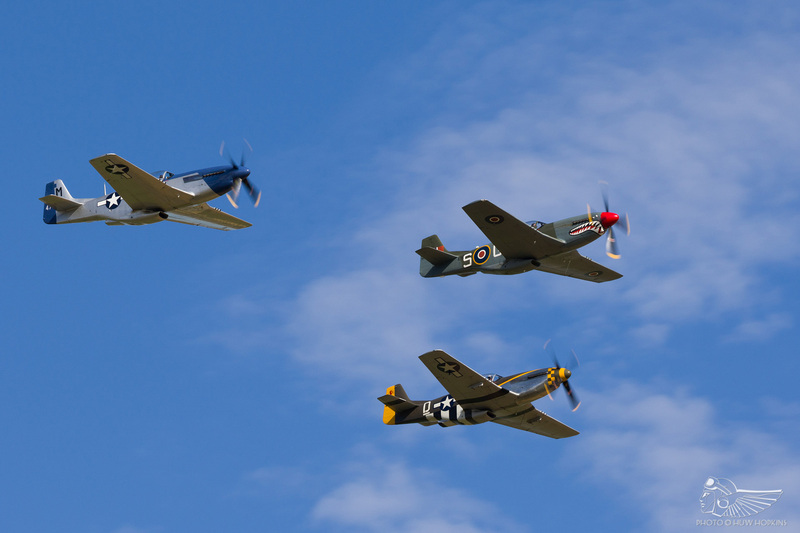 Flying Legends has typically featured a smattering of heavier vintage types. This year, the popular Swiss Classic Formation returned for the second consecutive year with their exquisitely polished Douglas DC-3 Dakota and Beech-18s, whilst Dakota Norway’s DC-3 offered a dynamic solo display. Returning to the ‘Legends programme after several years’ absence was Plane Sailing’s Catalina, which flew alongside TFC’s Grumman Wildcat (flown with tremendous verve by Dave Southwood) in one of the best sequences of the weekend. It was excellent too to see several pilots making their first Flying Legends appearance. 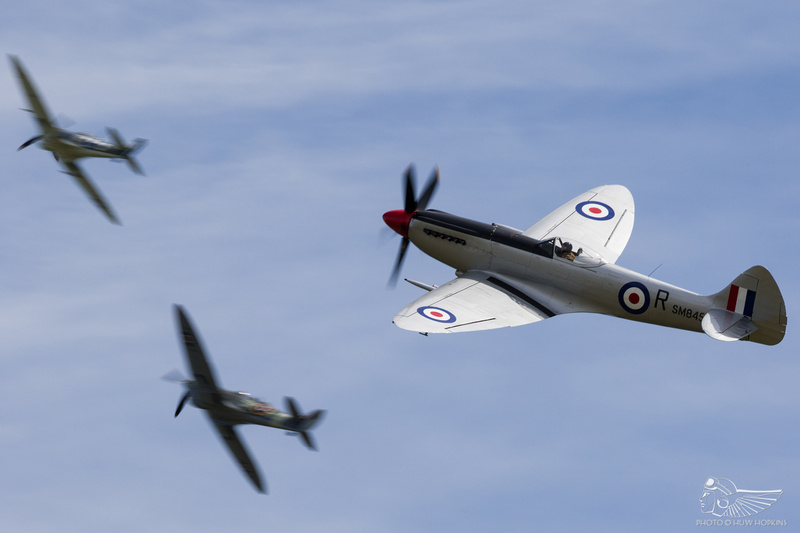 The historic scene depends on new, younger blood coming up through the ranks and seeing John Dodd (P-51D Miss Helen), Mark Levy (TF-51D Miss Velma), Alex Smee (Spitfire Mk.TIX ML407), Matt Jones (Spitfire Mk.IX RR232) and Chris Carder (Spitfire Mk.TIX PV202) joining Legends’ famous multi-aircraft warbird displays, and the show-closing ‘Balbo’ formation, is a positive sign. The ‘Balbo’ is one of those timeless airshow set-pieces. Every available fighter, excluding the Hurricanes, is mustered for a mass take-off and formation to round off each day’s flying programme. 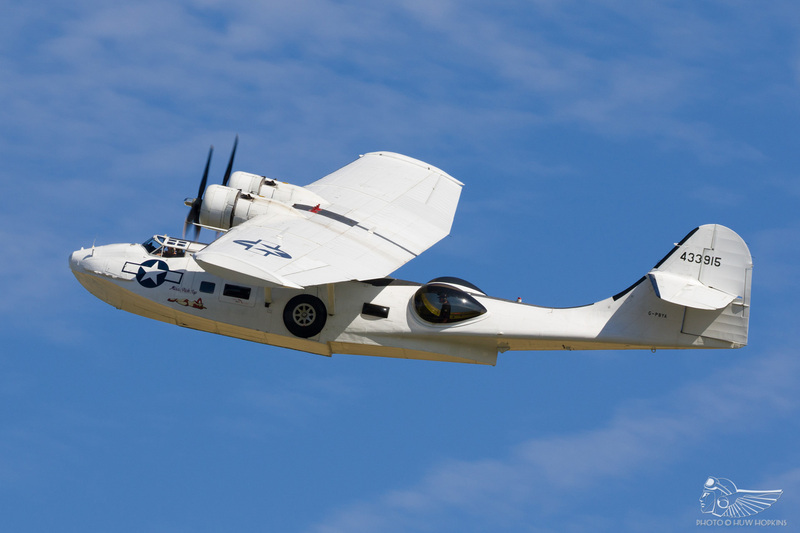 It’s all too easy to become blasé about the whole thing after 24 years, but assembling so many historic aircraft of differing characteristics and capabilities is a tremendous feat. 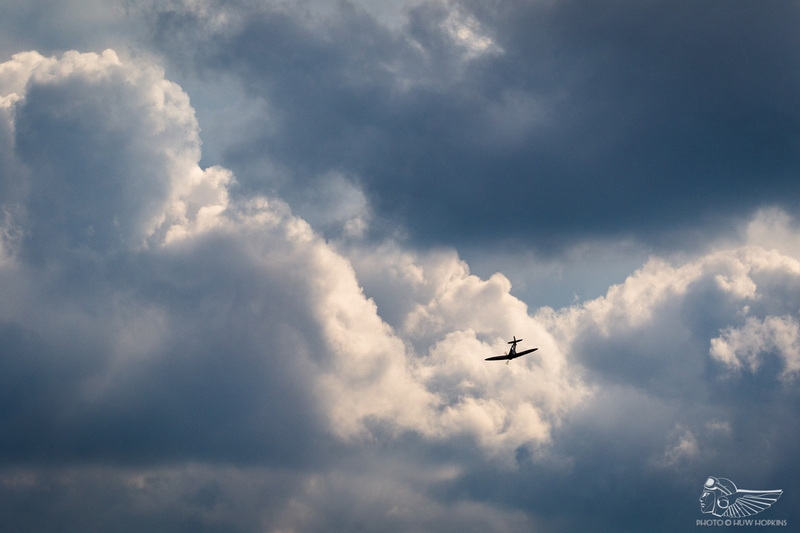 Visually and aurally, there are few equivalents in the aviation world. As the ‘Balbo’ formed up to the south, the “joker” took the stage. Traditionally the “joker” slot has belonged to Stephen Grey and following the Boss’ retirement in 2013, his son Nick has taken on the mantle. Following Berlin Express’ canopy disintegration earlier in Saturday’s programme, the honour fell to Richard Grace to entertain the crowds in the Fury ISS – ‘Legends aficionados will note that this is only the second time that the “joker” has been handed to someone outside the Grey family, the first being Paul Bonhomme’s legendary Spitfire Mk.XIV throw down in 2000. There was a nice poetry to it – Pete Kynsey forming up the ‘Balbo’ as his protégé held court. Sunday saw a ‘Legends “first” as Richard Grace and Nick Grey shared “joker” duties in the Fury and Comanche’s Spitfire Mk.I X4650 respectively. The low-level, high-energy aerobatics evoked memories of the late, great Ray Hanna and left more than one spectator with a tear in their eye. 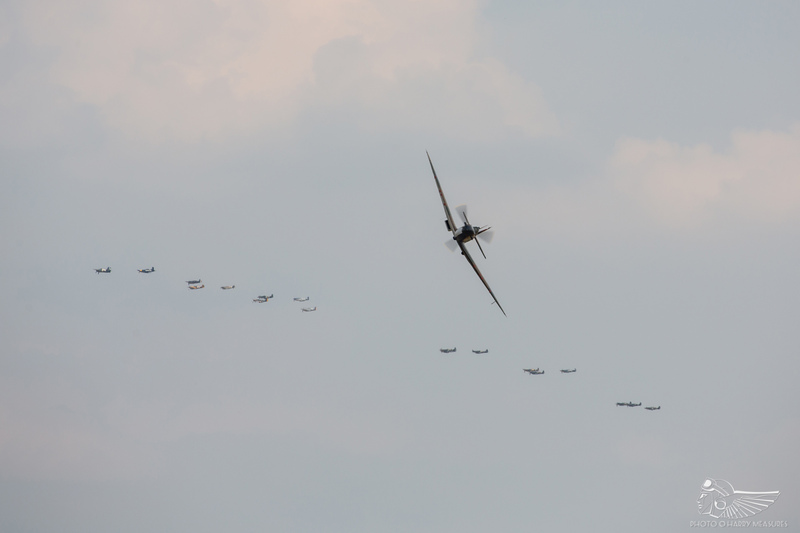 The ‘Balbo’ itself comprised 19 warbirds this year, with Pete Kynsey leading the massed formation in TFC’s Bearcat. After two passes, each element ran through at lower level to break to land, signalling the end of the show. At this point during Sunday’s climax, TF-51 Miss Velma suffered engine issues and made a safe, controlled forced landing in the fields to the east of the aerodrome; the pilot walked away unharmed and the aircraft will undoubtedly fly again, which is about as positive a result as anyone could hope for in the circumstances. Flying Legends 2017 was a thoroughly enjoyable affair. Whilst continental visitors were thin on the ground compared to previous years, the high quality of flying and a smattering of débuts ensured a number of memorable moments. 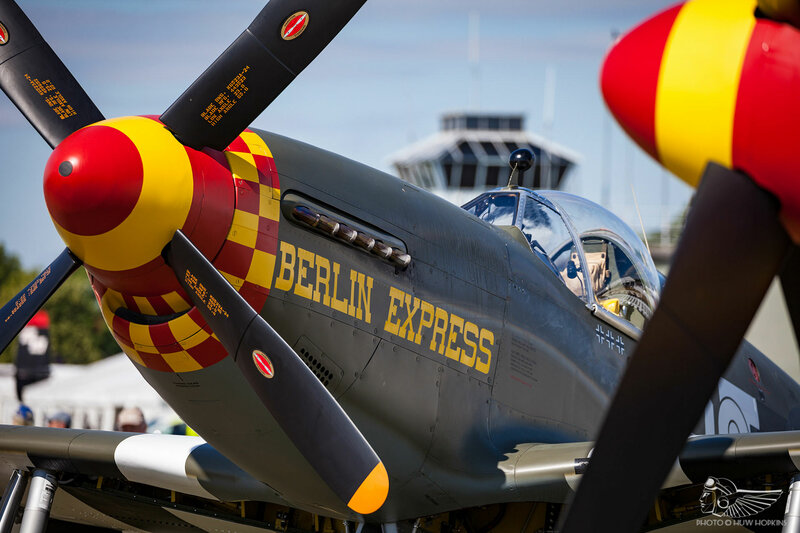 Stephen Grey, Jane Larcombe and team have consistently delivered exceptional Flying Legends line-ups for the last 24 years, cultivating a deserved reputation as one of the very best airshows in the world.